A 40 metre motor yacht, the seventh hull in Italian yard Benetti's Classic Supreme series, has been sold by Marc Haendle at Ocean Independence. Currently under construction in GRP at Benetti's Viareggio yard to RINA class, she is designed by Stefano Righini and scheduled for delivery in March 2016. Now 35% complete, she will have an interior designed by Allesandro Pullina of Pullina DNA accommodating 10 guests in five cabins. These consist of a master suite, two VIP suites and two twins, all with LCD televisions and full en suite facilities. 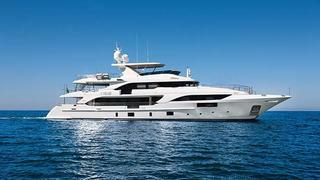 Twin 1,450hp MTU engines will give her a cruising speed of 14.5 knots and a range of 3,500 nautical miles at 11 knots.